Click on the left navigation column to visit. 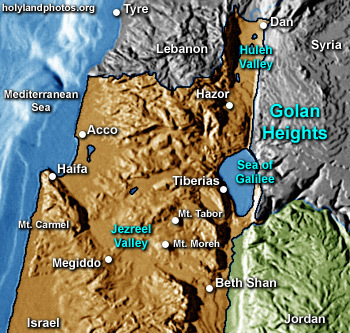 This area of the country receives over 40 inches of rain per year and is a major water source for the Upper Jordan River and the Sea of Galilee. For a geographical description of this regions see Carl Rasmussen, The Zondervan NIV Atlas of the Bible (Grand Rapids, MI: Zondervan, 1989), pp. 29-30. To view for purchase Click Here.